Preparing for a championship competition can cause a lot of performance anxiety for professional and amateur athletes. Often, an athlete has prepared their entire life to perform in the big game or match, which can lead to pressure. How athletes cope with this pressure determines if they will choke or rise to the challenge. Athletes will experience some anxiety about their big performances, which is common. As an athlete gains more experience, he or she learns to handle the pressure of big games and important moments in competition. Many athletes learn from their past experiences with sports anxiety and make the necessary changes to stay focused. Samantha Stosur, top ranked professional tennis players, uses past experience to learn how to stay relaxed and play her game. You might not be able to completely eliminate anxiety about a big game or performance, but you can chose to redirect your attention to good execution instead of worrying about the outcome. 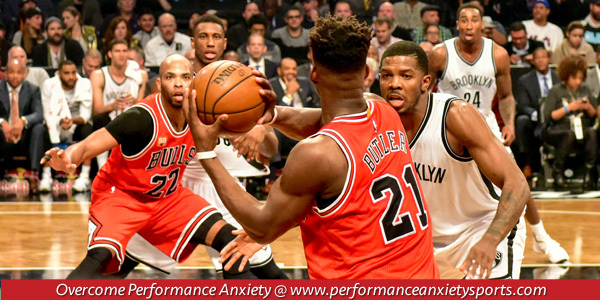 Seasoned coaches and players understand that some performance anxiety is inevitable and the goal is to just focus on what you do best. The reason why you practice and train hard is to play in the big game. Will you embrace the pressure or will you choke due to the pressure? The goal is for you to learn from your experience and use that to improve your success in future big games.